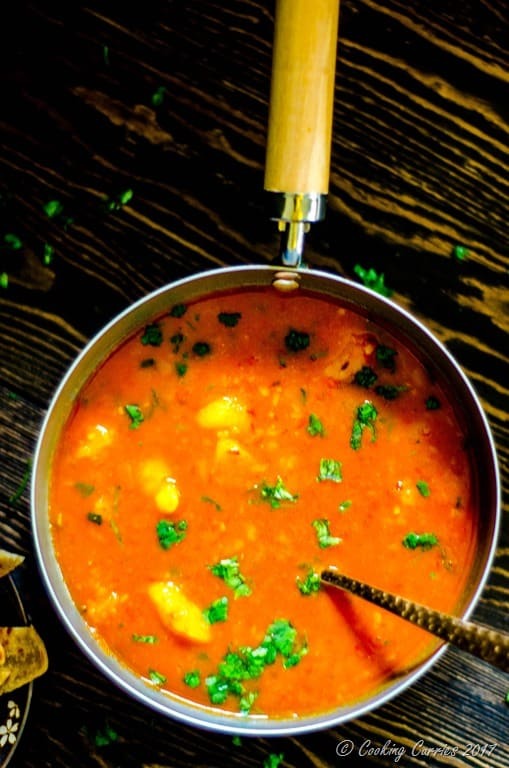 Cooked potatoes that are crumbled and simmered in a spiced tomato sauce, to make this No Onion – No Garlic recipe of Aloo Rasedar. An easy, under 30 minute recipe for a quick weeknight dinner. During my teenage years, there was a neighbor of ours, who was from Gujarat. She would often make traditional Gujarati dishes and some Northern Indian dishes and share with us, every now and then. I had just started cooking on my own then and I loved the different taste and flavors that all those dishes had. 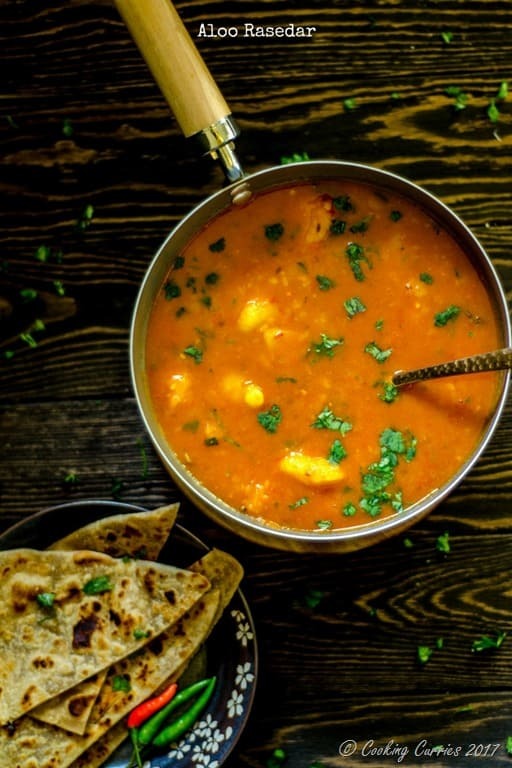 One such dish, I remember her making is this Potato Curry and even after trying to make it myself several times, there was something missing in mine!! I put a lot of ginger, garlic, onions, garam masala, everything for the falvor, but mine still kinda fell flat compared to hers. And much later, I got to know that there was something lot simpler in this curry, that made it what it is. There was no overpowering taste of onions or garlic. And not even a whole lot of garam masala. 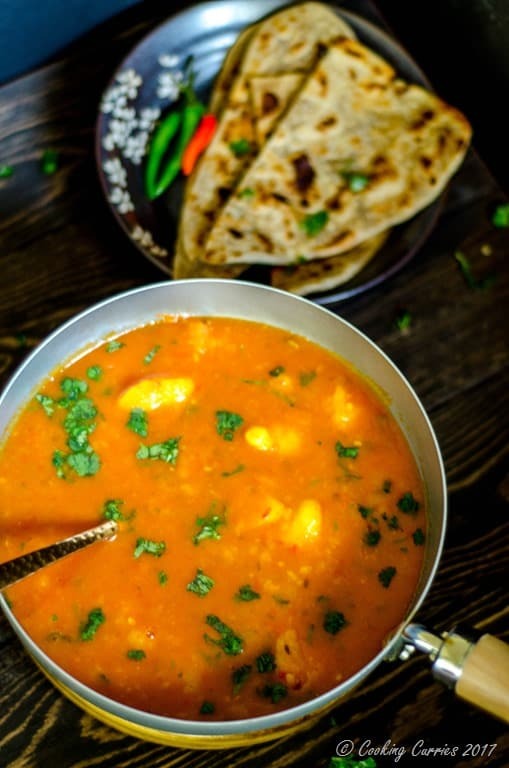 There was fennel and there was amchur / dry mango powder, which played up the tangy tomato flavor and that is what made this recipe so great and so different from a regular Potato Curry that you would make. 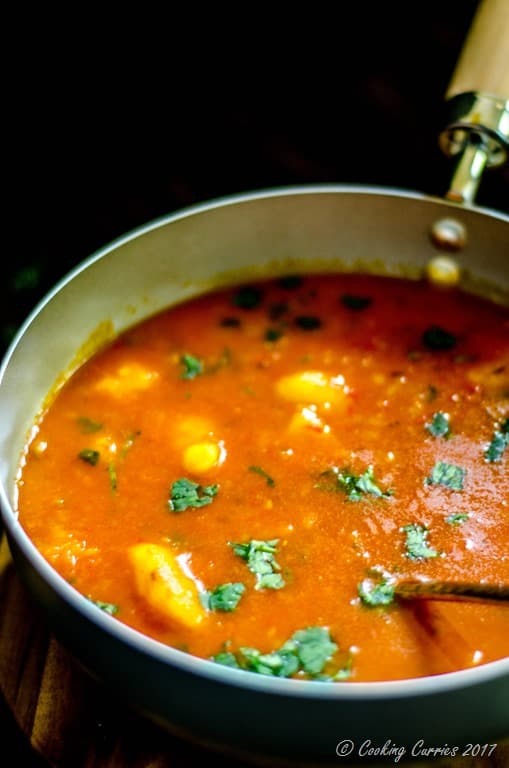 Dont get me wrong, I love a good potato curry and this Potato Onion Tomato Curry is one of my all time favorites, so is this Kerala Style Potato Curry with Coconut Milk. But sometimes, you just need to get a certain combination of ingredients just right and they make an entirely different dish of something else altogether. Cook the potatoes as a whole, poke some holes in them with a fork to help cook quicker. Once cooled, remove skin and crumble them with your hands. In a pan / kadhai, heat the oil and add the cumin seeds to it. Once they splutter, add the ginger, asafetida and the green chillies. Add the tomato puree as well and let it cook for a couple of minutes. Now add the turmeric powder, fennel powder, red chilli powder, coriander powder, amchur and garam masala to it. Mix well and let it cook for a few minutes. Add the salt and the crumbled potatoes and a little water to make the sauce base a little thinner. Cover and cook for a few minutes, till all the spice flavors get absorbed into the potatoes. Tasty recipe can be prepared any day. Goes well with poori or Paratha. Simple, quick and yet so tasty. Absolutely delicious, i will sure try to make this recipes.Thanks for sharing!